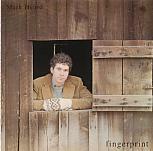 Mark Heard's second album (not including his self-produced album), Fingerprint is available on CD; it's been re-issued by Via (the same people who brought us the 77s boxed set, 1 2 3) under license from Fingerprint Records, Fingerprint was released in 1980, and includes a wide variety of Mark's early styles including light rock ("I'm in Chains"), James Taylor ballads ("Nowadays") country hokey ("Just the Same"), early CCM/Pat Terry ("One More Time"), John Denver ("Epistle"), live Looney Tunes-type silliness ("Es Tut Mir Leid") and Norman-Stonehill silliness ("Threefold Amen" - actually Mark Heard style silliness, but Norman & Stonehill are better known and did similar things). Mark's production & engineering talents are already as evident as his musical talents. Mark & Janet did the photography, and Janet added some BGV. This is an excellent album, if far different than his later work. Musicians: Mark Heard, Janet Sue Heard, Peter Johnson, Jon Linn and Tom Howard.